A 16-year-old sneaker-loving teen is using the footwear to get a different kind of kick. He's opened a pawnshop that uses athletic shoes as collateral. Chase Reed and his father, Troy Reed, opened Sneaker Pawn on Lenox Avenue in New York City's Harlem neighborhood. They're looking to capitalize on America's multi-billion dollar athletic footwear market. And the high prices sneakers can get being re-sold. The idea started close to home, when Chase would ask his father to borrow money after Reed had spent hundreds on sneakers for his son. Reed would hold onto a pair of his son's shoes until he had gotten his money back. "My son said, 'Dad, you're actually kind of making me pawn you my sneakers,'" Reed said. "Once he said that, a light bulb went off." He told his son, "You don't have any money, but you got all these sneakers. Imagine how many other kids got all these sneakers and probably need cash." The duo decided to renovate the space in Harlem, where they had been living before moving elsewhere, into a retail location. And to help pay for it all, Chase sold his own collection. "My father told me, certain things you have to sacrifice," Chase said. Basketball sneakers can sell and re-sell for hundreds of dollars. The cost depends on the shoe model, how limited the production run was, and how easy it is to find a pair in good condition. Sneaker Pawn carries shoes with price tags of more than $1,000. The shop opened about six months ago. It offers different options. People looking to just unload their sneakers specifically basketball shoes can offer them to the Reeds to be bought outright. Or they can leave the shoes for sale by the Reeds. That nets the Reeds 20 percent of the final sale price with the rest going to the original owner. Those looking to pawn their sneakers have two months to redeem them for the amount of money the Reeds forwarded them plus a storage fee. Shoes that are being pawned are held in storage and not displayed. The owner either gets them back or gives them up. Chase, as the sneaker aficionado, has the final say on whether they buy a certain pair from someone. He also decides what prices they sell the shoes. He customizes some sneakers with his own art. Since he's still in high school, his father handles the running of the store during the weekdays. Fourteen-year-old Harlem resident Chaise Mack shelled out a couple of hundred dollars for a pair of Air Jordan sneakers released in 2012 that sell online for at least twice the price that he paid. The store, he said, "is amazing." "You can't really find sneakers like this downtown. Most of the sneakers here are not in retail." It's been a learning experience for Chase, who's had to put aside the re-building of his own collection. "Sadly there are a lot of size 14s that come through the store," he said. "The nicest sneakers on Earth that come through the store, and the first thing I do is sell them." He's philosophical about it. "I can't let my sneaker high get in the way of me making money, me being a businessman," he said. Critical thinking challenge: Why might a pawn shop for flip-flops be less successful? What makes the Super Bowl so super? This Is the story about a father and son making a pawn shop for shoes. The store is in my opinion a great idea because shoes are something that everyone will allways need. This is a good way for kids in such bad neighborhoods to focus on things other than crime and get money an easier way. I wouldn't buy used shoes because they might have a sent in the shoes. I buy new shoes instead of used shoes , new shoes a clean and smell better. 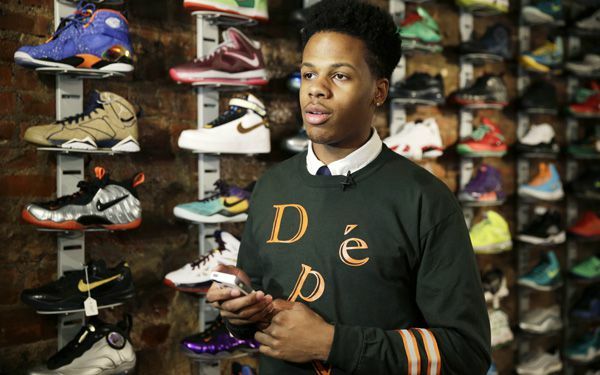 A 16 year old in Harlem made a pawn shop for sneakers. Here he buys and sells used shoes, some of which sell shoes for over $1000 dollars. These shoes are rare or valuable, and are some of the best sneakers on the planet. He started the buisness after he took a loan from his dad. This sparked the idea for the sneaker pawn shop. I think that it is great that a kid could start a buisness. The buisness should be very successful as sneakers are very popular nowadays. A pawn shop for flip-flops would be less successful because they break a lot. But shoes on the other hand don't break so easy because there made with a better material, and there a lot more conferrable for people to wear. I don't agree with this idea. I think it is not a good idea to sell used shoes, because no one knows who's worn them, and the shoes won't all be in the same condition as others. A pawn shop for flip-flops will be less successful because flip-flops are usually only used for summer and sometimes spring. Also flip-flops are easier to be worn down and easier to break.